An innovative medical product MiraCradle (TM) – Neonate Cooler, an affordable device for treating NEO NATAL BIRTH ASPHYXIA designed by our company DESIGN DIRECTIONS PVT. LTD. for Pluss Advance Technologies has won the PRESIDENT’S AWARD for Successful Commercialization of Indigenous Technology. The device does not require electricity to operate and hence extremely relevant in rural areas and mobile hospitals. Birth Asphyxia is the second largest cause of newborn deaths globally accounting for more than 600,000 newborn lives. India alone accounts for more than 125,000 deaths annually. Neonatal cooling or Therapeutic Hypothermia (THT) is the standard of care for birth asphyxia treatment. However, the only device available to perform the cooling treatment is imported and costs more than Rs. 20 lacs which cannot be afforded by most hospitals in India, and especially in Rural Hospitals. MiraCradle(TM) – Neonate Cooler is a CE marked affordable cooling device, developed in collaboration with Christian Medical College, Vellore. MiraCradle(TM) has been commercialized successfully. It is present in more than 130 hospitals across India and more than 1,000 babies have been treated. It is also being exported to South Africa, Kenya and Turkey. Exports shall soon start to Sri Lanka, Bangladesh, Pakistan, Uganda, Zambia, Indonesia, Philippines, Malaysia, Vietnam and Thailand. ~~ You are in a team developing a medical product such a a Live Camera Monitor that shows images from tiny cameras (arthroscopy) inserted in a patient’s body. This product is used by surgeons and their attending staff, such as operating room nurses. ~~ You are in a team that is formed to solve drinking water shortage in a community in a remote village. ~~ You are working on a project to help artisans, such as textile weavers, develop products for urban markets. ~~ Your company is a start-up in the healthcare sector. Your mission is to dramatically improve healthcare for senior citizens. You aim to offer solutions to prevent injuries from falls and the need for difficult surgeries for senior citizens. ~~ Impressed with traditional cuisine in India because of its time-tested health benefits, youwant to develop recipes for food items such as pizzas and pastries, but with traditional Indian ingredients. ~~ Your company offers innovative enterprise solutions based on a sophisticated technology platform. You wish to communicate this to decision-makers who are not necessarily familiar with the technology. ~~ You eat, drink and sleep games. You wish to develop a computer or a mobile game yourself. ~~ You want to develop a solution for the continuous monitoring of a semiconductor chip fabrication plant. The plant has hundreds of motors, pumps, valves and other devices. Device failures are very costly and the expert manpower to diagnose and maintain them is rare, and expensive. ~~ Fresh thinking: You will agree that there is a need to break fresh ground. Even if you are familiar with the sector (for example, healthcare, gaming), you need to think afresh. ~~ Multi-disciplinary experts: You need people from various fields to come together with a common goal. The experts will also need to be ready for fresh-thinking. ~~ Goal: You need a statement that defines what you are going achieve at the end of the project. This can be a broad statement like “we will develop a suite of products to protect senior citizens from fall related injuries” or a more specific one, such as: “we will develop a hip protector for senior citizens”. Project brief detailing specifications, timelines, markets, budgets and the like, need to be developed from the get go. ~~ Project team and a leader: You need a core team of people who will work on the project from start to finish. You’ll need a leader who is not only a good thinker, but is also the one who encourages everyone to think and contribute. The leader must be a no-nonsense task master. ~~ Project philosophy: The project plan must be based on sound principles. It needs to address these questions. How will you define goals? How will you familiarise and empathise with users? How will you define problems? How will you ‘model’ various realities? How will you ideate solutions? How will you test the problem definitions as well as likely solutions? How will you assess and handle risks? How will you test-market and update the products? How will you communicate and collaborate? A project plan can be prepared based on answers to these questions. Design thinking, which involves the various iterations of empathising, generating ideas, prototyping, and testing, needs to occur at all stages of the above kind of projects. For example, a goal or problem definition can be improved using design thinking. One can do a few iterations involving multiple ways of defining the goal. A common mistake is to define goals influenced by what is obvious. One can miss huge opportunities for fresh thinking because of such mistakes. Design thinking can be applied to testing methods as well. Design thinking need not be limited to creating a product or communication. Every team member needs to be reasonably comfortable with design thinking. Designers can help you with design thinking in addition to making their specialist contribution in research, problem definition, ideation, designing form or communications, prototyping and testing. This need not be limited to big development projects like the ones mentioned above. It is useful, even in small projects, and need not be limited to designers. Have you ever come across such situations? You notice that more than half the buttons on TV remote seem unnecessary. You have to squint and sprain your neck before you can read and adjust the cooling regulator in your fridge. Your WiFi router settings make you fret. You find it hard to recall how exactly you changed the line spacing in MS Word two days back or how it got changed. You swipe your ATM card, enter PIN, choose language, punch some keys, choose savings or current account (why? ), enter amount to withdraw and wait… only for it to tell you that you PIN was wrong, and forcing you to go through the steps all over again. Google Maps on your phone shows the road upside down no matter how much you shake it (that helpful compass needle isn’t there anymore after updates). You fiddle with the door latch on your way out and it locks so securely that your host must step in. You try to turn the door knob and your fingers get hurt between the knob and the door frame. When coming down in an elevator, you are not sure of which button to press to get to the floor where you came in from because you now discover that there are buttons marked L, LL, P1, P2. You can’t break the seal on a new LPG cylinder and, when you do, you are not sure if the new cylinder has been securely connected to your stove’s tube. You can’t make out which way the cylinder valve opens because the tiny arrows are embossed on black knob and they are just black lines on black. The two pins of your phone charger don’t match with two holes in your electric socket. You are in a mobile application with your phone in one hand and an umbrella (or a sandwich) in the other, and you now need to touch those three dots diagonally across the screen from where you thumb is to unlock your phone or the application. These are some minor irritants that have workarounds, and we can put up with them. But they do make you wonder, ‘What were they thinking?’ It’s obvious that what they were not thinking of was good design. Design thinking is for everyone; it can make our lives better in small and big ways. Thinking outside box is not an airy-fairy affair that means just looking at the blue sky. “Think innovatively outside the box,” he exhorted his colleagues. Clearly, Chetan was in a hurry. The team leader ran a brainstorming session to come up with ideas for a new app, that would help his company engage better with its customers. But while he casually threw around the words, in his hurry, he overlooked the fact that innovating isn’t very different from thinking outside the box. Perhaps he wanted to place a ‘double’ emphasis. Whatever his reason, the world seems to be placing increasingly greater emphasis on ‘thinking outside the box’ or innovation. This kind of thinking also enables one to use cutting-edge technologies innovatively in solutions such as remote patient care or student-centred learning. The most popular method of ‘thinking outside the box’ is by running a brainstorming session. But what really happens in a typical session? Consider Chetan’s group as one ‘box’ and their conference room as another box. People in a group put a limit on what can be said or thought. To understand this, simply observe what happens if one of the team members walks in late or someone from another group is called in. You will notice a shift in the conversation. This change is more evident when a boss walks in or leaves the room. There are other invisible ‘boxes’ that restrict our thought process — an individual, a team, a department, company, markets, social and cultural practices, and ignorance of technology, among others. However, we aren’t all that conscious of such boxes. A conference room, through its familiar walls, posters, pictures and even window blinds, cues us to a familiar thinking pattern, due to its sameness and familiarity. You notice this only when you get out of it. Without being aware of various ‘boxes’, it is impossible to think outside them. While ‘thinking outside the box’ needs a box that is big enough, one must ensure that it isn’t too big. Let me illustrate this. ~ How much of a budget do you have? Perhaps you can start the session with a discussion on the Big Box definition. The above questions will lead to more questions, which will in turn help in productive thinking. Having defined the Big Box, you have start demolishing the smaller boxes. Here’s how you can do that. Set a different perspective; ask people to play a customer and watch what happens; use a tool like Edward De Bono’s Six Thinking Hats, which helps people leave their personal boxes aside and think without inhibition. Another powerful tool is to devote some time to only asking questions. Avoid spending time in answering them initially. Here are some questions that can be asked in Chetan’s group: ‘Why would customers want to be engaged with us?’, ‘What will they get through engagement?’, ‘What will we get through it all?’, ‘What is meant by engagement?’ and so on. They say innovation or creativity is fun. This may be true for some who genuinely enjoy it. Or it could be also because of the way it is portrayed — companies like Alphabet or Apple make it appear fun. It is certainly cool to be a designer or an engineer who creates something new that gets talked about. But while the outcome of thinking outside box is exciting and fun, the creative process itself isn’t a walk in the park. It is like sweating and gasping through a hard climb to find the exhilarating breeze at the peak. Not everyone enjoys the climb; some may find it too daunting. Thinking outside box is not an airy-fairy affair that means just looking at the blue sky. You have to set up conditions, painstakingly navigate many questions, and rigorously harvest discussions. Thinking outside the box needs a big box, some rough rules of moving about, and someone who leads the project with clear goals, flexibility of tools, and the tenacity of a trekker — someone who considers pattern-busting thoughts a reward in itself. Cloud computing is passé; Big Data is getting bigger and mobility is a given. But what is stirring excitement and merger and acquisition deals is the ‘Internet of Things’ (IoT). Companies with their feet in the cloud (pun unintended! ), mobility, big data analytics, and the IoTs, are hot commodities. Firms that have cash to spare are buys buying big into the above areas. We will see more and more sector- or industry-defying deals — the idea of a Google car doesn’t seem an oddity anymore. IoT is at the epicentre of a tidal wave that is likely to overturn the established industrial order. Shorn of all jargon, the Internet of Things is a network of products and devices that are connected to the Internet. So far, people have been on internet through their computers and mobile phones, and have mainly used the Net for searching, browsing news, gathering information, shopping, planning travels, messaging, talking, collaborating, checking weather, watching events live, storing and streaming pictures, music and videos — countless other activities. In this sense, people are the acting agents in the ‘normal’ internet. One way to understand IoT is to imagine it as a kind of internet where the acting agents are ‘things’, not people — think car engines, tires, factory machines, appliances such as refrigerators, air-conditioners or heaters, and even streetlights and parking lots; whatever you can imagine can be fitted with sensors and internet connectivity. Networks of these can be formed. Cars already come with an army of sensors, measuring every conceivable parameter from speed, tire pressure and engine temperature to pitch and roll, acceleration and exhaust gas composition. Machines in factories have detectors and control mechanisms to automate them; wearable devices like fitness bands and phones have many sensors too. We already have many instruments in our homes, offices, factories, and public spaces that are fitted with sensors, and some of these have forms of connectivity, such as bluetooth, RFID, analogue interfaces or Wi-Fi. A lot of work is taking place in research and development of new sensors and what are called ‘motes’. Motes combine a sensor, some electronics for interface, memory, computing, and a means of powering all of this. If they can be miniaturised, such intelligent sensors can be embedded in a variety of things — they can be implanted in a device, stuck on, or worn. They can even be sprayed — in farms, for example, they can measure soil moisture content, conductivity and other parameters as feedback to begin drip irrigation or replenish doses of nutrients. These ‘things’ can also be equipped with their own diagnostics. So, what do we mean when we say the ‘acting agents’ are ‘things’? In simple terms, it just means that motors, thermostats, sprinklers, valves, lamps, cars and other instruments fitted with such ‘motes’ will generate information, share it across the IoT network and act on information over the network, with minimal human intervention. Human beings (still) need to figure out how to group ‘things’ fitted with ‘motes’, what they will share and in what ways they will act so that the IoT network does something more productive than what they (the humans) could have contributed. What IoT networks can achieve is hindered only by the factors given below. One can imagine how and why the resistance to change will come about. The Google Car, yet to be commercially available, is already seen as potential threat to the existing order in the world of automobiles. Companies like Toyota are scrambling to produce their own automated cars. Pushback from existing car companies, regulators who listen to existing industry players, and social factors (like cabbies’ unions) will naturally play out. Google Car is an IoT network by itself (with numerous sensors and actuators working to a plan) connected with other cars and with a super network of networks. In this, human beings can just feed information about where they wish to go and input the road rules of the game, and they might be dropped off there. In healthcare, the entire chains, from patients to physicians, pathology and diagnostic centres to hospitals and specialists are likely to morph into something entirely different through a combination of IoT and traditional computer networks. In homes, you can imagine that in homes, an IoT network may allow control of lights depending on not just the time of day or movement of people but also based on whether your television is on (to provide some ambient lighting to cut glare or contrast) or whether you are listening to music. Even the curtains or window blinds can be adjusted. Humidity and temperature sensors connected to IoT will help you optimise energy consumption. All these are possible, but the challenge will be in developing IoT apps that make various settings easy and which can learn your preferences. Researchers are working on ‘cells’ which generate electricity from body heat. Such energy sources will be a boon to wearable devices or even body implants equipped with IoT networking. One can only imagine how value chains in industry will undergo upheavals. Tremendous value locked in existing ways will be destroyed and be captured in newer ways. IoT networks will generate data that are orders of magnitude bigger than humans now create. Obviously, we will need even bigger capacities in big data analytics and cloud technology. You can now understand why cloud, big data, mobility, and IoT are hot. It’s likely that you will deal with the emerging IoT network related businesses while working with a start-up or with an existing player. If you extend your knowledge into other areas and spend time imagining, you may surprise yourself. You will need to indulge your imagination time and again. People capable of breakthrough thinking will be in hot demand — ‘imaginators’ will be in as much demand as the techies. Article written by Hemant Karandikar. How do you brand ‘thinking’ ? Pune has always been a city of learning, scholarship, values, enlightened thinking and action. The city today boasts of the presence of thought leaders from all walks of life be it art, culture, education, law, science, engineering, politics, trade, commerce, manufacturing industry, knowledge based services, and so on. The Pune International Center (PIC) is a world class think tank, it provides a public forum for free & fair debates on policy, and it promotes art and culture. That was the design challenge. We needed to communicate profound and abstract thinking prowess. We needed to reflect aspirations, yet bring out the quality of intellectual output rising above the ordinary. After much brain storming a logo concept was finalized and designed by Falguni Gokhale, Director Visual Communications, Design Directions, Pune. Lotus which is a symbol of beauty, art, intelligence, enlightenment and growth was chosen. The ‘whirls’ signify churning (manthan) of thoughts which bring out the core or the essence. The gold signifies purity of thought, the burgundy-pink express the youth and festivities and the blue signifies wisdom of people of Pune. The traditional motif in ‘international’ context creates a modern but timeless expression. The logo received CII Design Excellence Award. The PIC produces its brochures and policy papers under this identity and these are well received. A field hardened sales chief once remarked that a key audience group of your marketing material is your sales team. He was so right! In a previous post I illustrated use of visual language for communicating brand or product identity message. Brand message needs to be simple. But we also need to communicate complex messages related to a corporate brand or a complex product or a suite of offerings. The challenge for visual communications here is entirely different. An engineering group having presence in textile engineering, liquid transfer, high speed print solutions, machine to machine communications, and clean technology through several business entities, the design challenge was to communicate all these under a single corporate master brand umbrella. Such complex information places considerable cognitive load and a reader may gloss over some important part of the message. The base requirement in the above situation was that the reader should be able to visually register in her mind the corporate brand, several lines of business, and existence of business entities. She can then pay more attention to area of her immediate interest. 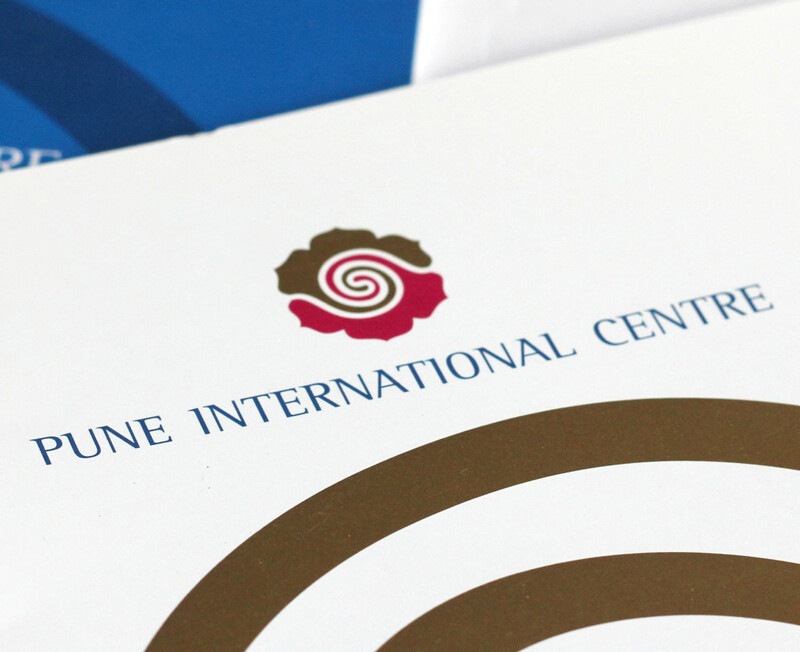 The corporate brochure was well received by the company’s existing and prospective clients. What’s more, the above corporate brochure became an important marketing collateral. It directly addressed the needs of sales engineers in early stage communications in a typical sales cycle -when you are introducing your company. Imagine a sales engineer having to explain the above message! He might either lose the attention of his prospective customer or he may rush through his talk by skipping what might be relevant! Communications need to be put in the context of business processes like selling or buying. That’s another design challenge! When you have developed the right design philosophy, your next challenge is creating the visual language which will convey your philosophy. Q: How will you convey “(respect for) tradition, (spirit of) celebration, and authenticity” visually -all at once? A: There are (there must be) many ways of developing the language. Your design language will depend on the target audience and the product. 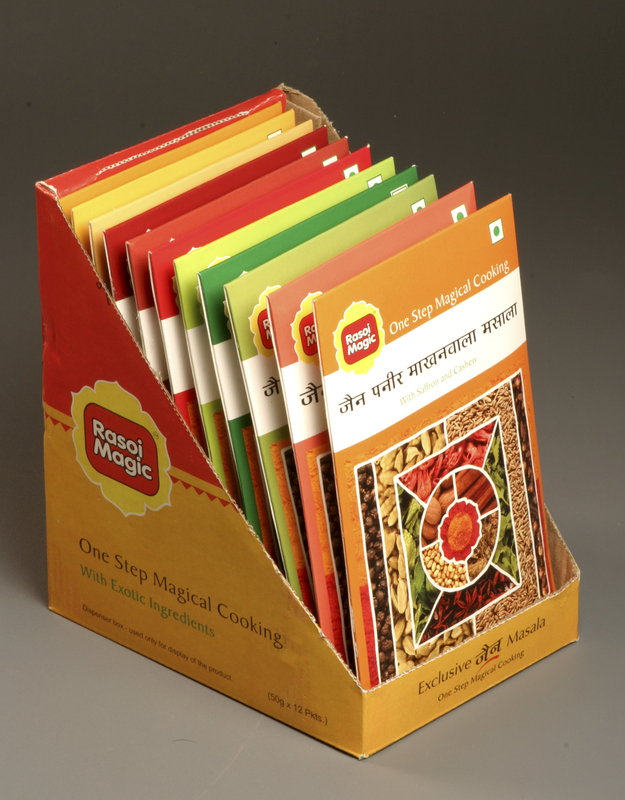 Here is what Falguni Gokhale, Director, Visual Communications at Design Directions, Pune came up with for ready to cook spice mixes for the Jain community. Noticed the graphic in white line (drawn as ‘Rangoli’) which depict the auspicious Jain ‘Mandala’, the spices used for coloring, and the over all bright effects?